Do you have these hair problems? There's no need to worry! These problems are very common and can be fixed. Dry scalp: Our body produces less natural oils as we age, which means that our scalp can get dry and irritated more easily. These problems can cause thinning hair. Cuticle thinning: An unhealthy scalp doesn't just make your hair look flat and limp. Over time, it also weakens and thins the hair's protective cuticle. A weak cuticle can no longer protect the hair from damaging moisture entering into the hair, leading to worse and worse problems. Enter Suntory Enherb Shampoo and Conditioner! The Suntory Enherb Shampoo and Conditioner fixes these two problems by harnessing the life force of herbal extracts. Enherb shampoo and conditioner targets the causes of hair problems that come with age. Suntory Enherb Revitalize Shampoo is a silicone-free shampoo perfect for anti-aging care. It contains two types of herb extracts that have been carefully selected for their vitality and revitalizing “Herb Energy”. As we get older the scalp and hair benefits from a more gentle wash. Suntory Enherb Shampoo contains amino acids carefully designed to cleanse the hair and scalp without stripping moisture away. Japanese Beech Tree Bud Extract: This shampoo contains extracts from the buds of the Japanese Beech tree, which overflows with the life force. This tree is often called the “tree of everlasting youth” in Japan. Suntory has harnessed the power contained in the buds of this tree. Young Orange Extract: This herb has been used as medicinal treatment in Japan since ancient times. A concentrated youthful, power is found in this plant, which have been carefully selected for extraction at the optimum time for the most concentrated and powerful effect. This shampoo is made with ingredients that maintain the moisture and health of the hair, providing the perfect environment for hair growth. Massaging the scalp is very important as we age! Massage leads to good circulation, which in turn means that we grow more hair. Jojoba oil and ginger help the fingers glide through the hair, boosting the effects of your scalp massage. 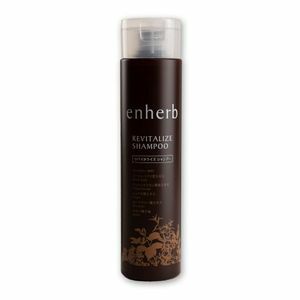 Enherb Revitalizing Shampoo's fragrance has been designed to help return you to your natural, relaxed state. Ylang ylang, geranium, grapefruit, and lavender aromatic extracts create a fresh and clean aroma that feels as though you're washing away all the day's tiredness. Enjoy a fresh and clean feeling in your mind and body. Grapefruit: Just like its scientific name, paradisi, implies, the grapefruit has a refreshing, sweet and bright fragrance. This aroma is a pick-me-up even when you’re feeling down. Lavender: This fragrance is popular even among aromatherapy practitioners. Its sweet and fresh scent washes away stress for a feeling of pure relaxation. Has a calming and soothing effect. Other fragrances: Orange, lime, peppermint, rosemary, basil, and clove. Looking for the best deals for SUNTORY Enherb Revitalize Shampoo?